Well, this seems a sneaky trick. I love what's going on in the flavored chip world right now. We're no longer stuck in the days of only having plain, barbeque, sour cream and onion, or salt and vinegar to choose from. Just last week, while hungrily stalking the aisles at Target, I spotted some Lay's bacon wrapped jalapeno popper chips - heck yeah. I'm pretty sure I ate half the bag standing in the parking lot. All sorts of other flavors out there, and hopefully coming up on pone of my seasonal favorites from TJ's pretty soon...but the heck is this??? Stop trying to sneak salad into my snacks! 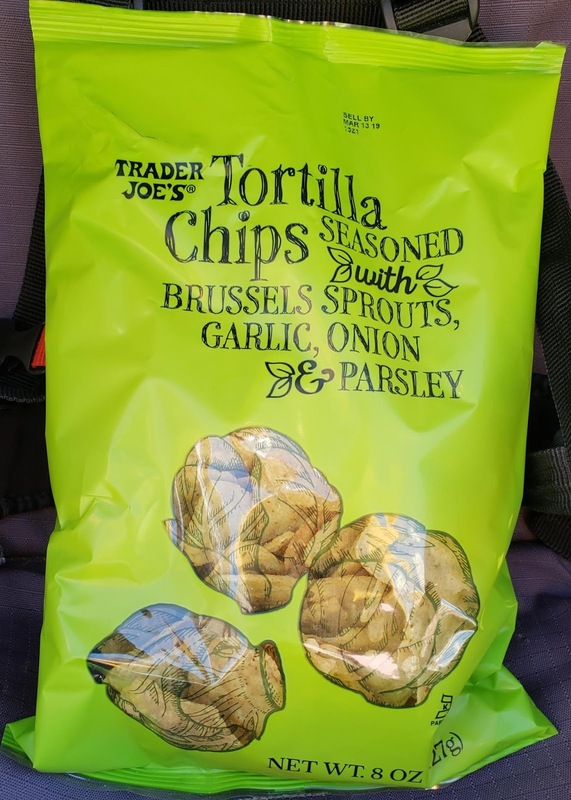 But such it is with Trader Joe's Tortilla Chips Seasoned with Brussels Sprouts, Garlic, Onion & Parsely. Jeez, they may as well as call them "garden variety" chips or something of the sort. The name's too long, make it snappier. Fortunately, these are pretty snackaholic-worthy crispers that, in the right mood, can go for total inhalation. It's the texture, for me. Instead of just regular corn chips, these TJ's chippies are made from a blend of corn, rice and potato, making a lighter, crispier, airier delight. 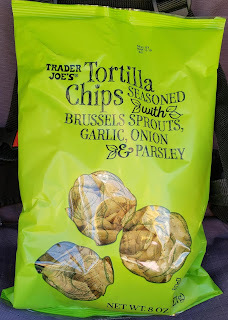 If you're familiar with TJ's sweet potato tortilla chips, these seem to have a similiar feel, which I love. Much better than regular corn tortilla chips or Tostitos in my opinion. And the thing is, you can barely taste the brussels sprouts. They're more visible as tiny green specks than tastable, I think. If I close my eyes and try hard, a little sprouty sense begins leaking through, but not much. It seems to be more power of suggestion aided by a little salt and accompanying flavors, none of them terribly obtrusive. A little garlic here, a little onion there, a wee bit salty lime over there. These vegetable cornucopia chips taste great plain, as my whole family enjoyed while walking around on a day out this past weekend. But anythign else you could possibly use a tortilla chip in or with would almost certainly work. I can't imagine them not being a good choice, even if brussels sprouts aren't really your thing. It's a worthy buy at $2.99, so let the chips fall as they may. Tried these at the tasting station- where’s the salt?!?? The **entire point** of chips is something salty and crunchy! Not salty enough. And whatever brussel sprout powder they sprinkled into the batch were negligible, from the name i was hoping for some kind of cruciferous flavor but no.